One of the qualities which distinguishes my portrait paintings from other artists is the technique that I use to build complex, weightless, translucent skin tones. My approach to painting has grown in to what it is today by developing a process of carefully laying several base layers allowing time for each layer to dry before proceeding on to the next, so that when the final layer goes on it allows the depths of the previous coats to show through. The finished result is a skin tone, which, like skin itself, catches the light translucently. My passion for painting fine art has always been present within me, my lens of visualisation encapsulating ideas with a radiant and whimsical note. Over the past 10 years my pursuit has been to add another dimension to my art, and that is to communicate my work with articulate brush strokes as did masters of the 16th and 17th century, such as Rubens. Unfortunately these physical painting skills are no longer taught and have largely disappeared from art schools. For portrait, wedding, or anniversary commissions, click here for enquiry details. Yawing is the sickening wallowing of a vessel in a cross sea, when pitching and rolling alternate and the hull is severely tested. My life yaws from time to time, but the times are just seasons which pass for whatever reason. Sometimes they can be managed, sometimes they are just endured. Cloud of unknowing: We all would like to be masters of our lives and masters of the world around us but often I find life is a hazy, formless place. Not threatening, but not secure either. It just extends outward in all directions is barely perceptible shapes that cannot quite be understood. Iron sky: Sometimes the road ahead seems hard and impenetrable, like the rusted plates of an old steamer,l the shear sides of an enormous hulk lying across our path. Beating upon it and calling out seem to no avail. Door: Somewhere sometime a door will open the cloud and reveal a way through to the stars. When the hum and rush of life dissolves and the eternal is revealed in quiet splendour, and we realise that it has always been there and always will. Rain: Gold needles of life rush over us and drain off our body heat, chilling us to the bone. The syllogism paintings explore the interior struggles we each face between our spirits and our flesh, and exterior struggles with each other. I presume other people find life as challenging and mysterious as I do, life can well support considerable thought in the effort to untangle it. What is our place in the web of life? What a tenuous but determined hold we have on life as earth and mankind struggle with each other, and we struggle with our own interiority. How permanent life seems as we go about our daily lives, but how fragile, and what of the spiritual dimension? How does it impact this existence, and how will it impact in the future? In the civil defense series, scale and composition are manipulated to diminish mankind and empower earth, a limited palette of cool transparent colours creates a sombre mood of apocalypse. Many of the civil defense paintings appear on the surface to be prosaic landscapes of the Hutt Valley, but others reveal a gathering gloom a the foot of menacing hills. In the background crouch the inevitabilities of faultline, river and sea. 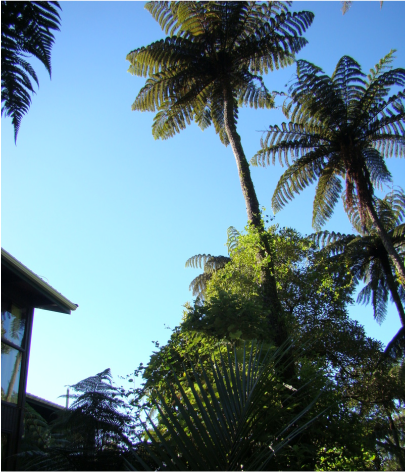 My studio and home are sublimely inspirational, surrounded by giant tree ferns, pungas, and nature. The pungas tower 20 metres tall like cathedral spires, but in contrast to the hard materials of stone spires, when the wind blows, they sway a long, slow dance as they arch their fronds up to the sky. I live in the bush clad hills of Hutt Valley, a short 20 minute drive from Wellington, the capital of New Zealand.